You might be the type of person who’s been wearing glasses for so long you would think people would not even recognize you without them. If you suffer from myopia, hyperopia, presbyopia or astigmatism, you likely have to wear corrective lenses all day for many practical reasons. physical traits, wearing prescription glasses can limit you in several ways. Think of the reflections and distortions you’ve got with glasses, the splashes you experience when it rains, or the effect of steam when you enter a warmer space. And then there were all those situations and activities – like running or wearing festive eye makeup, for example – when they were downright getting in your way. Well, you can gladly renounce all that once you switch to contact lenses because there’s a whole new life beginning from that moment on. You suddenly have a full field of focused vision, and you become able to track any action with sharp, direct and peripheral vision. You’ll be able to jog, swim, dance and wear as much eye makeup as you want without worry. Deciding that you don’t want to wear frames anymore can occur for many reasons. But wearing contact lenses is possible — if you can stand touching your eyes, because that’s something you’ll be doing every day and night. If your eyes are too sensitive, chances are you might have trouble getting used to this routine. Before making any purchases, get a trial pair and test it out. If you are a good candidate for lenses, then you’ll be faced with another decision. The current contact lens technology provides us with so many available options that you could easily get confused between the soft ones, the disposable ones or the rigid gas-permeable lenses. It’s best to get expert advice and assistance from the doctor as well as the specialist in the store, instead of choosing on your own. While you may be enthusiastic to lose those glasses, you should nevertheless consider money. Lenses are more expensive than glasses, even if they only cost $1 a day as some campaigns claim. Some designer frames may indeed cost you few hundred dollars, but the amount of time you’ll be using them covers the expense. So make a monthly estimate of what you can afford to spend on good contact lens, then look for an offer that suits your budget. It’s true that switching to contact lenses can be a liberating change from frames obscuring your face, to all the nose and ear itches you can get from wearing glasses for hours on end. But there are also exceptions that you should consider. Unless you wear daily disposables or 30-day extended-wear lenses, your schedule and working hours should be able to accommodate taking them out and regularly cleaning them, at least every 8-10 hours. If maintenance is not a problem, then the regular soft or rigid types are highly suitable for you. 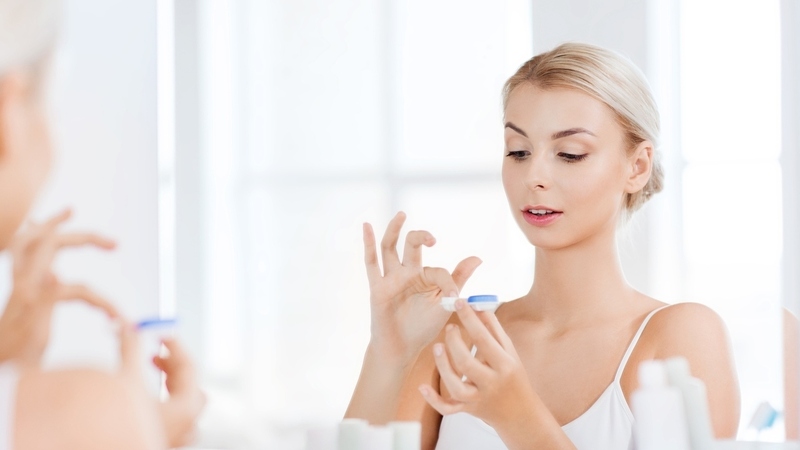 According toone study, 40-90% of contact lens wearers do not follow proper care instructions. Eyes are gateways into your body, and they can easily be penetrated by viruses and bacteria. Avoid the eye infection danger by always washing your hands thoroughly when you handle contact lenses, as well as keeping your face and eye area clean. Wearing contacts can make you forget you even have a vision problem. But before swearing off prescription glasses, weigh in all the arguments. There will be times, like when you are in public, that you’ll much rather prefer being frame-free. But there will also be situations, like at home reading or surfing the internet, when you’ll feel like putting on the glasses just to give your eyes a break. When it comes to vision correction, prescription glasses may be the classic choice at hand. If you’ve never dared to look at life without them, the tips above should be good enough to get you started on a new frame-free journey.